The state exam bill has been given a go-ahead at the government session on Saturday. Education Minister Abdilaqim Ademi and his deputy Spiro Ristovski informed at a press conference Sunday that the Government passed a set of five reform bills pertaining to the primary, secondary and higher education, including the state exam bill the public debate about which would follow immediately. According to Minister Ademi, the state exam is a mechanism of verifying academic knowledge and measuring the effect of what the state has invested in the future academic community. "The Government strongly believes that the state exam will contribute to a better higher education quality. That is our reason for introducing it. All the other theories that with it the universities' autonomy will be violated, that the state wishes to control professors and harm students, etc, are just inventions fabricated by certain political structures," he said. - Prime Minister Nikola Gruevski leads the Government delegation which Sunday departed on a political and economic visit to the Kingdom of Saudi Arabia. During the visit of the capital city Riyadh, Gruevski will meet with the political establishment of the country, with the Prince of the Kingdom of Saudi Arabia Salman Bin Abdulaziz Al – Saud, with the Managing Director of the Saudi Fund for Development Yousef Bin Ibrahim Al Bassam and with the Secretary General of the Gulf Cooperation Council Abdul Latif Bin Rashid Al Zayani. - The political relations between Macedonia and Hungary are great and there is the continuous and principled support of Hungary for the Macedonian accession in the EU and NATO, concluded Foreign Minister Nikola Poposki and its counterpart Peter Szijjarto Thursday on a meeting in Budapest. Macedonia and Hungary this year mark two decades since the establishment of the diplomatic relations. An estimated 10,000 students from all ethnicities rallied in cities across Macedonia on Wednesday to express their protest against the idea of introducing a state-supervised exam at universities. "We have been silent long enough," "Stop bad reforms," "Your eyes do not deceive you, students have something to say," "Professors, speak your minds" "External testing for the government" read some of the signs written in Macedonian, Albanian and English that students at the main protest in Macedonia's capital, Skopje, carried while marching from the campus of the University of Ss Cyril and Methodius past the parliament building all to the way to the government building. They were joined by professors, students from Tetovo, parents, hundreds of high school pupils, pensioners and redundant employees. The march went peacefully without any incidents and without any party symbols whatsoever. While being taught that rule of law and other principles are much valued in European circles, we have learned that the most important is the position of force that Macedonia has most strongly felt on its own skin, said Macedonian Foreign Minister Nikola Poposki in his address at the conference Balkan Revival: Kick-Starting Stalled Policies organized by the non-governmental organization Friends of Europe and the Konrad Adenauer Foundation in Brussels on Tuesday. The discussion at Friends of Europe’s 12th annual Balkans Summit addressed how and to what degree the EU and Western Balkan countries need to remain focused on enlargement perspectives, particularly in light of new European Commission President Jean-Claude Juncker’s recent statement that there will be no further EU enlargement over the next 5 years. Minister Poposki took part in the second session titled "Economic Development: Is the Glass Now Half Full?" in the course of which he pointed out that in carrying out economic reforms Macedonia scored better results than most EU member states. He also stressed that Macedonia was happy that the economy was getting into the focus of the EU since Macedonia had much to boast in this respect. "As far as the economy is concerned, GDP per capita in the Western Balkans is half the average GDP per capita in the EU member state and there is much to do in this regard. However, the situation is getting better in fighting unemployment. 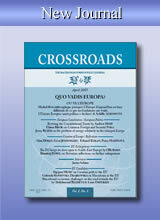 Also, Macedonia's economic growth is higher than the economic growth of some EU countries," Poposki said. - The historian Amet Sherif, biochemist Velimir Stojkovski and academic Cvetan Grozdanov are this year winners of the national prize St. Kliment Ohridski that Monday was presented to them on a ceremony in the Assembly. The EBRD is making a loan of up to €145 million to finance the modernisation of railway infrastructure in Macedonia and to strengthen the country’s regional transport links. The modernisation of transport infrastructure is one of the EBRD’s key priorities in the Western Balkans, helping to improve trade routes within the region, deepen market integration and develop stronger cross-border cooperation. This sovereign loan to the Macedonian Public Enterprise for Railway Infrastructure provides funding to upgrade the second phase of the eastern section of the Trans-European Corridor VIII. The organization of university students, Student Plenum, decided on Tuesday to stage another protest march next week and appealed to high school students, parents and professors to join them. "We appeal to all people who selflessly support their fellow citizens—the past, present and future generations—regardless of whether they are concerned by this problem or not. There are parents who do not teach their children to be servile and expect someone else to fight for their future. There are primary and secondary school students with greater urge for putting up resistance than those who raised them," reads the Student Plenum's announcement. Prime Minister Nikola Gruevski said Wednesday that the protest march that the Student Plenum intends to stage again was political motivated. In his address before the European Parliament Foreign Affairs Committee, Nikola Poposki, Macedonia's Foreign Minister, appealed for acceptance of the six consecutive recommendations of the European Commission for opening EU membership negotiations with the Republic of Macedonia so credibility in the process of enlargement could be restored. According to him, the three things that need to be paid special attention are the Thessaloniki Agenda of the EU and the major reassurance that the enlargement process has not been forgotten; the six consecutive EC recommendations for opening accession talks with Macedonia, which have not been accepted by the European Council; and the EU's resolve not to admit any new members in the next five years. "At the moment Macedonia focuses on what the Union defines as High Level Accession Dialogue (HLAD), which suits us, considering HLAD centers of Chapters 23 and 24 as crucial. There is also a separate chapter on good-neighborly relations, which does not mean Macedonia's relations with its neighbors are bad. On the contrary, I find them to be excellent," Poposki said. - Republic of Macedonia will remain with reduced military presence in Afghanistan even after the ISAF mission but will yet be the biggest contributor per capita, announced Foreign Minister Nikola Poposki at the Foreign Ministers meeting of member-allies of the Alliance with the General Secretary of NATO, Jens Stoltenberg. AHMETI ANNOUNCES TAKING OF "UNEXPECTED POLITICAL DECISIONS"
No high-ranking BDI official is willing to explain what BDI leader Ali Ahmeti meant when he said at the BDI internal election conference Sunday that the party could take political decisions outside of its program. Ahmeti also said on that occasion that the country is faced with "problems demanding solutions and courage". "I won't explain now what those challenges are. It suffices to say that all citizens know that Macedonia is faced with numerous problems demanding courage and solutions that could be unexpected," Ahmeti said. - Foreign Minister Nikola Poposki participated this weekend on the 15th Francophonie Summit in Dakar, Republic of Senegal on a topic “Women and young people, vector of peace and growth”. Poposki supported the economic strategy of the Francophonie adopted in Dakar to pledge stronger economic and trade relations between the member-states. To a great surprise of many, representatives of the major governing and opposition parties in Macedonia held a meeting at the Radika Hotel in Leunovo over the weekend. According to the scarce information media could obtain, the event at which they met was a workshop on the development of education in Macedonia over the next two decades organized by the British Embassy in Skopje, or, to be more exact, the think-tank organization Wilton Park from London. The event was not heralded and took place behind closed doors, which sparked speculations that the education strategy was not the primary goal of holding this event. However, some of those who attended the workshop say the forum was not used as an occasion for holding secret talks between VMRO-DPMNE and SDSM in a bid to overcome the parliamentary crisis. The chances of finishing the procedure of adopting the constitutional amendments by the end of the year are getting ever slimmer. Even though the initial plan was to vote through the amendments by the middle of October, the procedure will most likely be completed in the early months of 2015. The absence of SDSM from the Parliament is said to be one of the reasons for the delay bearing in mind the criticisms of the international community and their appeals that such an important undertaking should not be carried out without the opposition. Parliament officials say that the third and final stage of the procedure of altering the Constitution will begin once the Government provides the constitutional amendments to Parliament. The Ministry of Justice, on the other hand, says the amendments will be provided to Parliament for approval once it is finally determined which remarks from the public debate and the Venice Commission should be incorporated in the final draft. After an 18-month break, the dialogue between the European Parliament and Macedonia resumed in Strasbourg on Wednesday. Although Alojz Peterle, Co-Chairman of the EU-Macedonia Joint Parliamentary Committee (JPC), had earlier called on the opposition to take part in the meeting, the Macedonian delegation Wednesday consisted solely of representatives of VMRO-DPMNE and BDI. The JPC held its last meeting in May 2013 shortly before Brussels decided to put on hold the High-Level Accession Dialogue, the meetings of the JPC and the Enlargement Commissioner's visits to Macedonia due to the failed political dialogue in the country. Whether this means that Brussels wishes to begin from scratch and renew its relations with Macedonia will become clearer at the EU summit in December. - Foreign Affairs Minister Nikola Poposki addressed the inauguration of the Honorary Consulate of the Republic of Macedonia in Ohrid, and highlighted the importance of the several-decade friendship and partnership of Macedonia and Poland. The event was attended by the state undersecretary of the Poland Ministry of Foreign Affairs Artur Nowak-Far and the state undersecretary in the Poland Ministry of Infrastructure and Development Marcin Kubiak. - Prime Minister Nikola Gruevski Monday officially undertook the one-year presidency with the Central European Initiative (CEI) from the former chairman from Austria. Prime Minister announced that the main priorities of the Macedonian Presidency will be the membership of the countries from Western Balkan in EU and the construction of the road infrastructure. A civil concept by which all ethnic groups in the country would be equal and ruling out the option of Macedonia's federalization are some of the key principles of Besa, the new ethnic Albanian political party, promoted in Skopje over the weekend, Dnevnik reports. "Our main commitment is ensuring a new political and social order in the country. We need to build a new state different from those created in 1945, 1991 or 2001. Not only the Framework Agreement but all other previous orders in Macedonia were adopted in a time of war. We should pause to think what next needs to be done with this state," said Bilal Kasami, coordinator of Besa's initiative council. - More than ten foreign investments come as result from the work of the 28 promoters and the diplomatic-consular representations, announced the chief of Macedonian diplomacy, Nikola Poposki according to which the economic diplomacy has positive effects. November 17, International Students' Day, was marked Monday with a protest march that several thousand students staged against the government proposal of introducing an external examination at all universities—both private and public—on the results of which it will depend whether students will be allowed to continue their higher education or not. "No to the External," "The External Exam is Titanic for Our Education," "We Are People, Not Numbers," "This is the Beginning, Not the End," and "You Want to Make a Monument Out of Our Education, Too" read some of the banners carried by the students of the University of Ss Cyril and Methodius. The protest began from outside the University of Ss Cyril and Methodius and ended outside the Ministry of Education where a small delegation of students held talks with representatives of the institution. All along, they were escorted by about a hundred police officers taking care of the safety of those protesting and of all other citizens. - From 2014 to 2020, 664.2 million euros from the EU will be available to Macedonia via the IPA2 Programme, of which 205.9 million euros is for carrying out EU membership reforms, 298.8 million euros for regional and socio-economic development, 53.2 million euros for employment, social policies, education, gender equality promotion and human resources development, and 106.3 million euros for agriculture and rural development. Foreign Minister Nikola Poposki contradicted the reports that he had accepted to talk about identity issues, in view of the proposal that BIRN has recently revealed. According to Poposki, those reports are misinformation and manipulation mismatched with reality, whose primary goal is to underestimate Macedonia's positions to this strategically important issue. "The positions we have assumed to this imposed dispute are principled and unambiguous," reads his announcement. At his first meeting with reporters on assuming the office of Spanish Ambassador to Macedonia, Mr. Ramon Abaroa Carranza said his country supported the idea of the European Commission's assuming a new approach to Macedonia for the purpose of unblocking the country's European integration. "For the first time ever, there are ideas in the European Commission of assuming a different, more active approach to Macedonia, that is, to the resolution of the name dispute and the country's European integration. I do not know how these ideas could be carried out. What I do know is there are ideas which have not yet been developed in detail," Ambassador Carranza said. Madrid believes that the name dispute is a bilateral issue that should be resolved within the framework of the UN, while Spain, Mr. Carranza said, supports the European integration of Macedonia even more now that the European Commission has issued its sixth recommendation for opening membership negotiations. After meeting the negotiators of Macedonia and Greece, Vasko Nuamovski and Adamantios Vassilakis, in New York on Tuesday and Wednesday, UN mediator Matthew Nimetz said no progress had been made in the resolution of the dispute. He also informed that he did not put forward a new proposal and that he merely discussed with the negotiators some of the ideas tabled in the past. "Both parties reiterated their sincere wish to see this dispute resolved, to develop good relations, peace and stability in the region. We all know this is a very difficult issue. We have not made any progress today but we are determined to continue talking in the months ahead. We discussed certain ideas from the past, how successful they can be and how they could change to be better," Ambassador Nimetz said. He also said he hoped that Macedonia and Greece now have better understanding of the points the other party found critical. Macedonia negotiator Naumovski reiterated Macedonia's readiness for holding talks at a higher level to help resolve the dispute. Greece has long been rejecting this proposal. 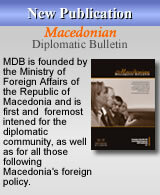 - Macedonian Foreign Minister Nikola Poposki and Dan Oryan, the Israeli Ambassador to Macedonia, signed a protocol on diplomatic training of the Ministries of Foreign Affairs of both countries in Skopje on Monday. The protocol creates conditions for promoting relations and establishing regular cooperation between Macedonia and Israel. - German Foreign Minister Frank Walter-Steinmeier at the conference at the Aspen Institute in Berlin, in relation to the dispute between Macedonia and Greece, said that Germany cannot order Greece to solve the issue. US Deputy Assistant Secretary of State Hoyt Yee added that the name issue is not only a bilateral issue but a regional one. Macedonian Foreign Minister Nikola Poposki said that the six-year postponement of the start of negotiations has consequences for Macedonia. The Ministers of Foreign Affairs of Germany and Great Britain, Frank-Walter Steinmeier and Philip Hammond, gathered in Berlin Wednesday their counterparts from the Western Balkans at a conference that was a follow-up to the traditional annual meetings held at this level and to the leaders' meeting held with German Chancellor Angela Merkel in August of this year. The conference was held in the offices of the British Embassy and was split into two parts—a political and an economic one. It was said at the beginning that the political part would focus on certain pressing issues in the region, without any explanation though what those issues are. The goal of this initiative is giving a new impetus to the resolution of pending issues while attributing just as much relevance to economic cooperation. The meeting was also attended by representatives of the EU and NATO, as well as by Hoyt Brian Lee from the Bureau for European and Eurasian Affairs of the US Department of State. - Upon the invitation of the heads of the German and British diplomacy, Frank-Walter Steinmeier and Philip Hammond, Foreign Minister Nikola Poposki on Wednesday is to take part in the Conference of Foreign Minister of Southeast Europe in Berlin. - Bosnia and Herzegovina on Monday opened an honorary consulate in Bitola and well-known Macedonian singer Biljana Damjanovska Jancevska was chosen as the Honorary Consul. The honorary consulate was opened by the deputy ministers of foreign affairs of both countries, Dragana Kiprijanovska and Ana Trisic Babic.